When you hear the words "You're going to be a grandparent!" life changes forever. We create unique gifts for new grandparents and grandparents to be. Our large selection of creative and inspiring presents will help you celebrate the anticipation and welcome the newest little family member. 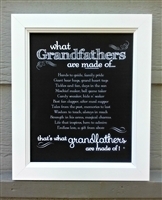 From a grandparent ultrasound frame revealing grandbaby on the way, to baby's first handprint frames, and beautiful framed grandparent poems, you will find our gifts for new grandparents both touching and memorable. Our first-time grandparent gifts celebrate the amazing feelings of this special time and welcome them into their new role with a thoughtful gift they will love and appreciate. We also carry Christmas gifts for new grandparents like our best-selling ornaments and picture frames that can hold memories for years to come. We have many gift ideas for first-time grandparents in our store. 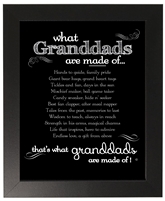 Browse through our wonderful collection of gifts for grandparents-to-be, from generational picture frames, inspiring poems,and personalized frames, you are sure to find a gift that speaks your heart.